Trying to boost someone's self-esteem can be rather unwise. In an earlier post I have explained that the idea that we first have to feel good about ourselves before we can function well is wrong. Trying to improve people's functioning by praising them abundantly in order to make them feel good about themselves does not work. In fact, trying to boost someone's self esteem is likely to encourage an unrealistically positive self-perception, a lack of concern for others, a tendency to dismiss negative feedback, trivialize one's own failures, take less accountability for one's own harmful actions, and agressiveness. Trying to increase someone's self-compassion seems a wiser choice. Recently, Steve Safigan wrote a interesting article about this. According to Kristin Neff (photo) self-compassion has three main components: self-kindness, common humanity, and mindfulness. Research shows that increasing self-compassion is associated with many positive effects such as life-satisfaction, wisdom, optimism, curiosity, learning goals, social connectedness, personal responsibility, and emotional resilience but is not associated with the above-mentioned disadvantages of increasing self-esteem. In solution-focused coaching and therapy there are several ways of supporting client's self-compassion. In the previous post I already mentioned normalizing. Rodney Daut said the following about this in a comment to the post: "that people are more compassionate with themselves and experience lower negative affect when they see that others have the same problems they have. The researchers call it percieving our common humanity. And it seems that's what you help clients do in SF". In addition to this, solution-focused practitioners attitude towards clients is one of acknowledgment and appreciation. They show understanding, acceptance and acknowledgement for whatever clients say, including what they say about their problems and their feelings about these problems. They don't confront or criticize clients but, instead, remain mild. All of this makes it easier for clients to approach themselves with compassion, too. Not only does solution-focused change offer some good ways of supporting clients' self compassion, my subjective perception is also that, over the years, in solution-focused practice there has been a gradual shift from supporting self-esteem to supporting self-compassion. In the past, solution-focused practitioners tended to use more direct trait compliments ("you are such a smart person") whereas nowadays they tend to use indirect process compliments ("how did you manage to accomplish that difficult task?"). In the picture below the arrows marks this shift. In light of the discussion of self-esteem versus self-compassion this seems like an important shift (so if this shift is not actually happening and a mere case of wishful thinking, I indeed argue it should happen). Direct and person-oriented compliments seem to create a higher risk of increased self-esteem including the negative behaviors associated with this. This post shows some empirical evidence for this claim. Indirect process compliments seem much safer in this sense. Furthermore they seem much more useful because they bring out description of what has worked well which may be used again. Thanks for quoting me Coert. Also, I have a question. If SF coaches and therapists moved away from trait praise to process praise, what led them to changing this practice? I'm curious to know because although I feel blessed to live in an age in which so many researchers are finding useful insights that can improve our lives, I'd like to know how a person can discover such insights from experience as well. I'm finding that shifting to the Growth Mindset and using the Kristin Neff's insights on Self Compassion have greatly improved my life. And I wonder what else I could be learning from my own experience that could be useful... and which I might discover if I find a powerful method to learn from life experience. Hi Rodney, I have written a lot about Carol Dweck's work including about what she's written about trait compliments and process compliments. I started discussions on mailing lists and got many responses. I am sure at least some people picked this up. Also, many people will have picked this up from Carol Dweck's wrof and other sources. In addition to this I have trained countless people in SF and have often stressed the importance of this topic. I hope other educators will have done likewise. I am sure there is now at least some awareness about the importance of this topic. But I am not sure how broadly it is being acknowledged and used. Great article! I like how you placed self-compassion in a larger context of being process focused. This is what I love about the value of social science research. Who knew that there could be something much better than direct, person-focused praise? 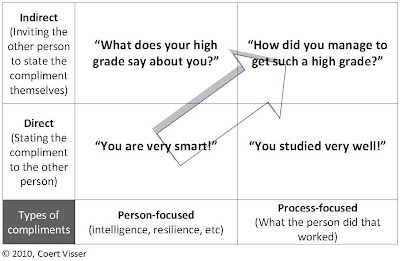 Oh, and I'm also a fan of Carol Dweck's work. Dear Steve, I am glad you like it. thanks for letting me know! Great job tying together different pieces of research and spreading the word about self-compassion! Compassion is a choice to honor and accept ourselves just as we are. Thanks for your article here. Hi Coert. I recently came across Kristen Neff's work via another channel and love the way you have identified how SF aligns with her findings. Is the word in the last paragraph meant to be "saver" vs "safer"? I have worked as a psychiatric nurse now for very nearly 10 yrs and have found trying to improve someones self esteem as some what papering over the cracks. A very good friend and mentor Dan Millman says in his book Everday Enlightenment that the degree in which we doubt our value/self worth is the degree in which we tend to sabboge our efforts. It has been my experience that people who have higher levels of self worth tend to have much more self compassion and a happier disposition. Hi Paul, thank you for commenting. To clarify, I thnk self-esteem is a wonderful thing and I have nothing against it (on the contrary, I mostly like it). The thing I am not for is the self-esteem boosting intervention in order to improve his functioning. In some case self-esteem even seems to be inappopriate (highly aggressive people can have high self-esteem and happiness). It seems like self-esteem is most healthy, valuable and justified when it has a strong basis in reality (when other people esteem the person too based on what he or she does and has done).